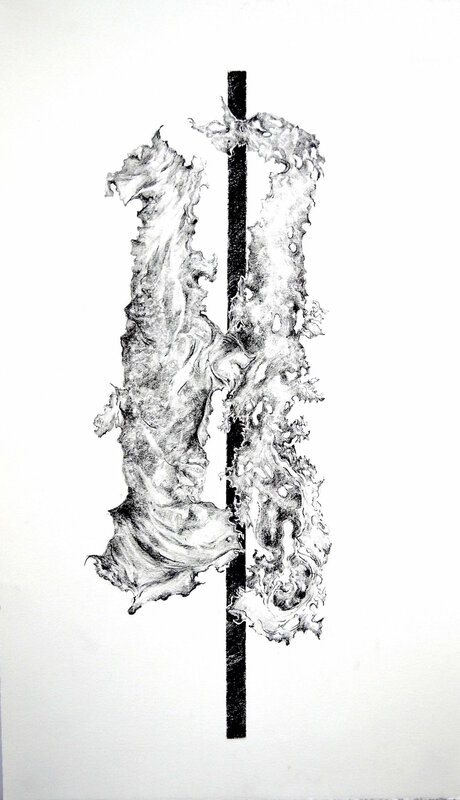 Flux and Form is a show of selected works on paper by Mary Hart and Marjorie Moore. In each project, the final pieces depict a collaborative process between the artist and her environment. For Hart, the drawings are born first from staining paper with ink and allowing the blot to spread naturally across kozo paper. Then she responds with a drawing. Hart describes the act as a hesitant departure from realism, but notes that it can be as generative as it is problematic. Sometimes she tries to control the stain with her pen and other times, she lets it inform her subject matter. Ultimately, Hart is trying to understand her artistic relationship with a fragile and dynamic world. Marjorie Moore’s final work on paper is an attempt to make sense of a seascape in constant flux; to classify what she sees on her beach strolls into a composition that feels coherent on paper. Her process involves transcribing an object found in nature onto the page, attempting at once to move it into the medium of drawing and honor its given form. Using grid, color, line, and traditional botanical drawing, she composes a guide to a landscape that is incredibly diverse. The results of both of these experiments are works on paper that revel in the surprise, fragility, and beauty of a world that is changing every day and play with the human desire to find order within complexity. Mary Hart is a painter and printmaker from southern Maine. Born and raised in Connecticut, she moved to Maine in the 1980’s to teach and paint in the Western Mountains region where her family has spent summers for 5 generations. She now lives and works in Portland, ME. Hart earned her BA in Art and English from Dartmouth College, and her MFA from the Milton Avery Graduate School of the Arts at Bard College. Among other locations, her work has been exhibited at Aucocisco Gallery in Portland, ME, the Portland Museum of Art, The Trustman Gallery at Simmons College in Boston, MA, and the Dunedin Fine Arts Center in Dunedin, FL. She has received grants to support her work from the Artist Resource Trust and the Maine Arts Commission, and artist residencies at Yaddo, SMCC, and La Dogana in Italy. She has been a visiting professor of art at Bowdoin, Colby and the University of Southern Maine. Marjorie Moore lived in Maine from 1970 to 1993 and throughout that period of time she was an active participant in the Maine arts community. She exhibited frequently in both private and public institutions including Barridoff Galleries, Davidson Gallery, Bates Museum of Art, The Farnsworth, and a one person exhibition at The Portland Museum of Art in 1991. In 1993, she relocated to Texas, living first in Houston and then in Austin, usually spending at least part of every summer in Maine. While in Texas, Moore continued to pursue an active artist career, exhibiting in galleries and non profit institutions. In 2012, Moore purchased a property on Great Diamond Island, Portland, Maine. In the summer of 2017, she moved back to Maine and is now a permanent, full time resident of the island. The direction of Moore’s work has evolved over several decades and includes many aspects of drawing, painting and combined media. She has a profound interest in the process of creating beauty from retrieved objects, both natural and human made. The categorization of objects in new kinds of taxonomy creates a narrative for her artistic pursuit.